On Saturday, April 9th the Minister of Forests and MLA John Slater will be cutting the ribbon between 11 a.m. and 12 p.m. at the Midway Mill site. Columbia Basin Trust will provide $17,000,000 in new funding in the 2011/12 fiscal year to support a broad range of initiatives throughout the Columbia Basin. 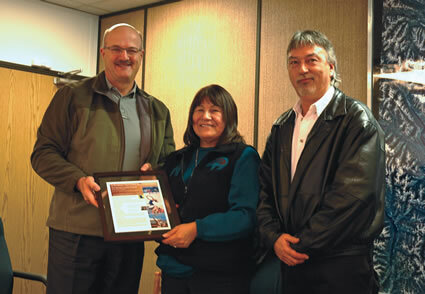 Just north of Castlegar lies the Zellstoff Celgar Pulp Mill; with its workforce of more than 400 employees, it is one of the key economic drivers of the West Kootenay. Using wood harvested from their community forest, the Ktunaxa Nation donated wood for a podium seen at the Pacific Coliseum. 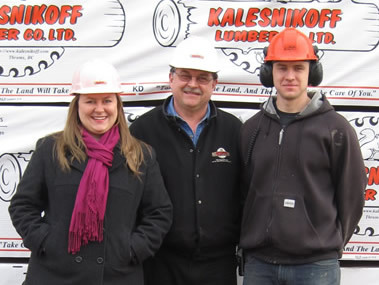 Krystle, Ken and Chris Kalesnikoff are proud of their family-owned and operated business.